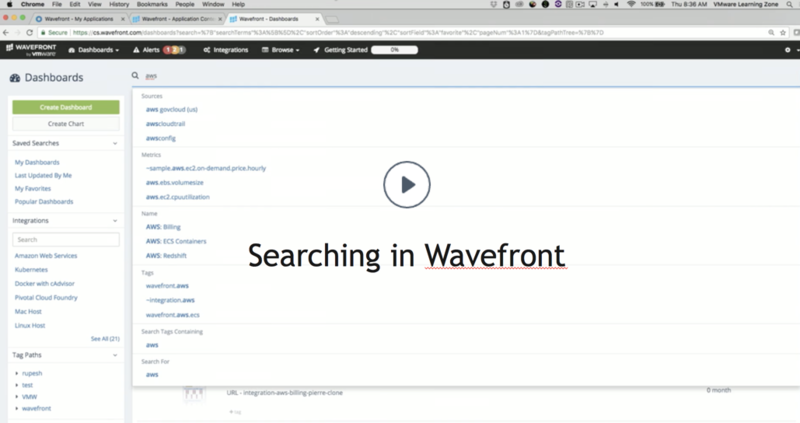 Learn how to search for objects in the Wavefront UI. To help you find exactly what you need, Wavefront supports tags and a variety of search features. Tags allow you to flexibly manage and organize your Wavefront content. Tag paths allow you to organize your content in hierarchies that best suit your particular use of Wavefront. You can include content in multiple hierarchies to suit the needs of different groups of users. All Wavefront browsers (All Dashboards, Alerts, Integrations, and so on) support a variety of search methods. You can search in the Search field at the top or in the faceted filter bar at the left. The search field at the top of every Wavefront browser page supports both autocomplete and search. We support autocomplete for many searches. Search fields support multi-word searches. If you type cpu usage in any browser or autocompleted text field, the dropdown list includes all matches for both cpu and usage. In the filter bar on the left you search by selecting facets, such as State and Severity for alerts, and by typing in Search fields. Some facets one some pages have their own Search field to limit the displayed facet values. Most pages support the standard facets Tag Paths, Tags, and Updated By. Most filter bars contain a set of commonly used saved searches (e.g. Favorites, Last Updated, Recently Updated, My ) and you can save your own searches. Once you press Return or Enter after typing a search string, the icons display at the top right, allowing you to share a link to, save, and clear the search. Your saved searches appear below the commonly used searches, and have a dropdown menu for renaming, cloning, and deleting the search. 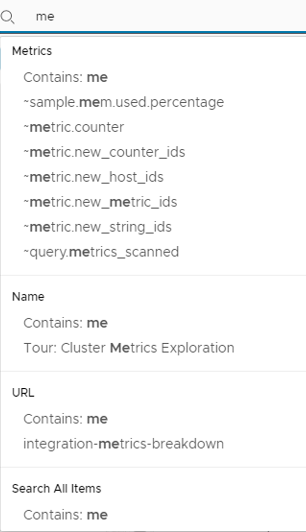 The following Alert browser filter demonstrates filtering alerts by the tag path Microservice.App4. This filters the view to show all alerts with the tag path MicroService.App4 and all its children (for example, MicroService.App4.Auth). Of the matching alerts, 1 is firing. The Wavefront UI supports tagging and other actions. 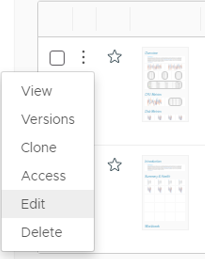 Tagging - Make a selection and click the tag buttons to create, add, and remove tags. Trash - Click the trash toggle to view deleted objects.